“Zachary Chesser: A Case Study in Online Islamist Radicalization and Its Meaning for the Threat of Homegrown Terrorism,” United States Senate, February 2012, 12, http://www.hsgac.senate.gov/download/zachary-chesser-a-case-study-in-online-radicalization-. Joshua Rhett Miller, “Road to Radicalism: The Man Behind the ‘South Park’ Threats,” Fox News, April 23, 2010, http://www.foxnews.com/us/2010/04/23/road-radicalism-man-south-park-threats/. In May 2010, Chesser and Morton used revolutionmuslim.com to call for the murder of an artist tied to “Everybody Draw Mohammad Day,” an event in support of artists who had been threatened for drawing the Islamic prophet. “Leader of Revolution Muslim Pleads Guilty to Using Internet to Solicit Murder and Encourage Violent Extremism,” FBI, February 9, 2012, https://www.fbi.gov/washingtondc/press-releases/2012/leader-of-revolution-muslim-pleads-guilty-to-using-internet-to-solicit-murder-and-encourage-violent-extremism. 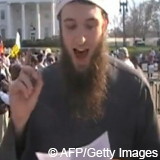 Chesser converted to Islam in the summer of 2008 while playing on a soccer team organized by a member of the transnational Islamist organization Hizb ut-Tahrir.“Zachary Chesser: A Case Study in Online Islamist Radicalization and Its Meaning for the Threat of Homegrown Terrorism,” United States Senate, February 2012, 5, http://www.hsgac.senate.gov/download/zachary-chesser-a-case-study-in-online-radicalization-. His writing soon appeared on the blog belonging to Anwar al-Awlaki—an American-Yemeni terrorist who was killed by a U.S. drone strike in Yemen in 2011. Chesser later admitted to corresponding with al-Awlaki via email.“Zachary Chesser Timeline,” Washington Post, accessed September 21, 2015, http://www.washingtonpost.com/wp-srv/special/metro/zac-chesser/. Approximately two weeks later, Chesser was stopped from boarding a flight with his infant son to Uganda, where he planned to continue onto Somalia to join al-Shabab. He was arrested approximately 20 days later and pled guilty in October 2010 to charges of “communicating threats against the writers of the South Park television show, soliciting violent jihadists to desensitize law enforcement, and attempting to provide material support to al Shabaab,” according to the FBI.“Wife of Zachary Chesser Pleads Guilty to Making False Statement,” FBI, November 8, 2010, https://www.fbi.gov/washingtondc/press-releases/2010/wfo110810b.htm. Four days following Chesser’s arrest, Morton fled to Morocco. He was arrested there on U.S. charges in May 2011.“Leader of Revolution Muslim Pleads Guilty to Using Internet to Solicit Murder and Encourage Violent Extremism,” FBI, February 9, 2012, https://www.fbi.gov/washingtondc/press-releases/2012/leader-of-revolution-muslim-pleads-guilty-to-using-internet-to-solicit-murder-and-encourage-violent-extremism. Chesser’s wife, Ugandan national Proscovia Kampire Nzabanita, had reportedly planned to meet Chesser in Somalia. In November 2010, Nzabanita pleaded guilty to making a false statement to a special agent investigating her husband. She also admitted that in 2009, she and her husband attempted to travel to Somalia so that Chesser could join al-Shabab. Nzabanita later faced deportation and reportedly fled to Jordan.Associated Press, “‘South Park’ Terror Convict Zachary Chesser: My Mother And The FBI Violated My Rights,” Huffington Post, March 25, 2015, http://www.huffingtonpost.com/2015/03/25/zachary-chesser_n_6943196.html. In June 2014, Chesser was transferred from prison in Illinois to a Supermax prison in Florence, Colorado, after he repeatedly organized unauthorized meetings with Muslim inmates.Meg Wagner, “Convict who threatened 'South Park' creators sues prison, claims it's difficult to practice Islam behind bars,” New York Daily News, January 9, 2015, http://www.nydailynews.com/news/national/south-park-terrorist-sues-prison-hindering-faith-article-1.2071959. ZakariyaJoshua Rhett Miller, “Road to Radicalism: The Man Behind the ‘South Park’ Threats,” Fox News, April 23, 2010, http://www.foxnews.com/us/2010/04/23/road-radicalism-man-south-park-threats/; “Zac Chesser’s manifesto,” Washington Post, accessed September 21, 2015, http://www.washingtonpost.com/wp-srv/special/metro/zac-chesser/docs/document-cloud-chesser-manifesto.html; “Zachary Chesser: A Case Study in Online Islamist Radicalization and Its Meaning for the Threat of Homegrown Terrorism,” United States Senate, February 2012, 8". Virginia-born Zachary Chesser is a homegrown extremist and would-be foreign fighter who attempted to travel to Somalia to fight alongside al-Shabab. “As Usama bin Laden said with regard to the cartoons of Denmark, ‘If there is no check in the freedom of your words, then let your hearts be open to the freedom of our actions.’”Joshua Rhett Miller, “Road to Radicalism: The Man Behind the ‘South Park’ Threats,” Fox News, April 23, 2010,http://www.foxnews.com/us/2010/04/23/road-radicalism-man-south-park-threats/. “I seek to help the world understand that neither the Muslims in general nor the mujahideen [holy warriors] including Al Qaeda are abject to peace, but that this peace come with the following conditions: a complete withdrawal of non-Muslim forces from Muslim lands, an ending of the propping up of the apartheid regime of Israel, and a ceasing of the propping up of the brutal dictators we currently have who refuse to rule by divine law. I also seek to help the world understand that there will be no peace until the above conditions are met. Basically the formula works like this … if you kill us, then we kill you. If you do not kill us then we can have peace. 9/11 had nothing to with freedom or democracy. It had to do with the murder of hundreds of thousands of Muslims around the world by American and other powers.”Joshua Rhett Miller, “Road to Radicalism: The Man Behind the ‘South Park’ Threats,” Fox News, April 23, 2010,http://www.foxnews.com/us/2010/04/23/road-radicalism-man-south-park-threats/. “[My goal for writing for Revolution Muslim is to] raise awareness of the correct understanding of key Islamic beliefs. If you kill us, then we kill you.”Joshua Rhett Miller, “Road to Radicalism: The Man Behind the ‘South Park’ Threats,” Fox News, April 23, 2010,http://www.foxnews.com/us/2010/04/23/road-radicalism-man-south-park-threats/. “Rather than fret over how to keep their children away from the worst of things (drugs, alcohol, tobacco, fornication, etc. ), the parents of today are fretting over how to keep their children away from the best of things (martyrdom and jihaad in Allah’s Cause).”“Zac Chesser’s manifesto,” Washington Post, accessed September 21, 2015, http://www.washingtonpost.com/wp-srv/special/metro/zac-chesser/docs/document-cloud-chesser-manifesto.html. “If we can ensure that the majority of the children of the jihaadiis will be raised with a love of jihaad in their hearts, then we will have achieved the best possible success on a list of goals in the da’wah.”“Zac Chesser’s manifesto,” Washington Post, accessed September 21, 2015, http://www.washingtonpost.com/wp-srv/special/metro/zac-chesser/docs/document-cloud-chesser-manifesto.html. “The basics of jihaad should be taught at the home from an early age. This should include prohibitions and notions of justice, because we cannot have ourselves raising a generation of murderers and oppressors. Rather, the full message of jihaad should be emphasized so that our children do not become prone to the various deviant groups that rely on their victims not understanding the foundations of a matter.”“Zac Chesser’s manifesto,” Washington Post, accessed September 21, 2015, http://www.washingtonpost.com/wp-srv/special/metro/zac-chesser/docs/document-cloud-chesser-manifesto.html.